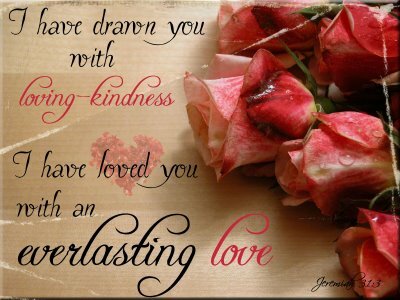 I love you with an everlasting love, says the LORD. I Am the love of your life which is now and eternal. Look to Me for all that you desire, for I AM more desirous to give to you than you are to receive. Come as a little child, in simple, childlike dependent faith and allow Me to meet your needs. I will give you the desires of your heart, for there is nothing beyond My power and ability, and I say YES to you. YES! I will! I desire to give you good things and embellish you with My best gifts. There is nothing that I will not grant to you as you release your faith in Me and receive. For it is already appropriated for you, says the LORD. I have given you access to My kingdom and you have the keys to all the storehouses of blessing. I have no favorites, and what I have given to others will be duplicated in your own life. Just believe and receive it, for all that I have belongs to you. There is more than enough and you will never exhaust My supply, says the LORD. Come and receive of My abundant supply for you, for you will never have to go without and you will never need to beg or plead. I will pour out My blessings upon blessings upon blessings to you as you seek Me earnestly and open your heart to Me. I will come in and fellowship with you and you will hear My still small voice on the inside of you. I will restore new life in you, and others will recognized that you are blessed by Me, says the LORD.